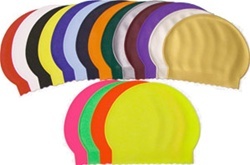 This is our most versatile swim cap. Been to a triathlon lately? They could be wearing our Latex swim cap. How about a team swim meet? Yup, the Latex Swimming Cap strikes again! These best-selling, printable pool caps come in colors to suit your mood, your style and your team's colors. Quantity discounts available! Quantity discount pricing will show in your shopping cart at checkout.